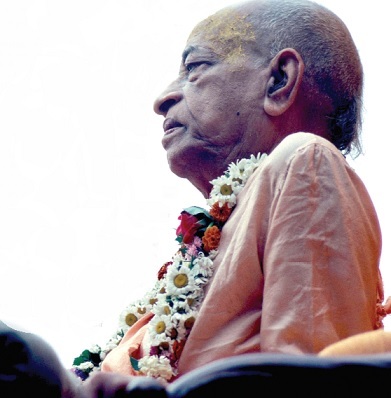 This conversation between His Divine Grace A. C. Bhaktivedanta Swami Prabhupada and some of his disciples took place at New Vrindaban, West Virginia, USA, on June 24, 1976. Disciple: Srila Prabhupada, once you said, “The tractor – this is the cause of all the trouble. It took all the young men’s farm work. It forced them to go into the city and become entangled in sensuality.” You said people had to leave the country and the simple life of goodness and God consciousness. And so they went to the city and got caught up in the anxious life, the mode of passion. Srila Prabhupada: Yes. In the city people must naturally fall into the mode of passion: constant anxiety due to needless lusting and striving. In the city we are surrounded by all sorts of artificial things for agitating our mind and senses. And naturally, when we have this facility we become lusty. We take to this passionate mode and become filled with anxiety. Srila Prabhupada: Yes. There is less disease. Everything is less brain-taxing. In the country the pangs of this material world are less. So you can arrange your life for real profit. Spiritual profit. Realize God; become Krishna conscious. And if you have got a temple in your home or near your home, you have a very happy life. You work just a little – just for your food – in the spring a month and a half or so for planting, in the fall a month and a half for harvesting. And in your remaining time, you become culturally enriched. You engage all your talents and energies for realizing God. Krishna consciousness. This is ideal life. You see the minute fibers on this flower? No other manufacturing process in this world can do this – such small fibers. And how brilliant is the color! If you study only one flower, you will become God conscious. There is a mechanism that we call “nature.” And from it is coming everything we see around us. Now, how is it that this mechanism is so perfect? And who has devised this mechanism? Srila Prabhupada: Yes. Most people think that by itself, unconnected with a painter, this flower has become beautiful. This is foolishness. “Nature has done it.” Whose nature? Everything is being done by the natural mechanism of Krishna . Parasya saktir vividhaiva sruyate: the Lord is orchestrating everything by His innumerable, inconceivable energies. Anyway, learn to love this natural mode of life, life in a wideopen space. Produce your own grain. Produce your own milk. Save time. Chant Hare Krishna . Glorify the Lord’s holy names. At life’s end, go back to the spiritual world to live forever. Plain living, high thinking – ideal life. Modern, artificial “necessities of life” may seem to increase your so-called comfort. But if you forget life’s real aim, that is suicidal. We want to stop this suicidal policy. We don’t directly attempt to stop the modern advancement of technology. The so-called advancement of technology is suicidal, but we don’t always talk of this. [Laughter.] People today are extremely attached to this socalled advancement. Therefore when Lord Caitanya appeared five hundred years ago, He gave a simple formula: chant Hare Krishna . Even in your technological factory you can chant. You go on pushing and pulling with your machine, and chant, “Hare Krishna , Hare Krishna .” You can devote yourself to God. What is the wrong there? Disciple: The leaders know that once a person starts chanting God’s names, in time he’ll lose his taste for this anxious life of technology. Srila Prabhupada: That is natural. Disciple: So the leaders know you are sowing the seeds of their destruction. Srila Prabhupada: Where is the “destruction”? Rather, it is construction: devote yourself to God, and live forever. This is the proper path. Follow it. You will live forever. By our method, tyaktva dehah punar janma naiti. After leaving your present material body, you don’t get any more material bodies. You regain your spiritual body and go back to the spiritual world. And without this spiritual realization, tatha dehantara praptiù: when you leave your present material body, you’ll have to accept another material body. So consider the two methods of living. Which is better? The “advanced” method – accepting more material bodies. Or our “oldfashioned” method – accepting no more material bodies. Which is better? As soon as you accept a material body, you have to suffer: birth, old age, disease, death. The material body means suffering. Therefore, if we prepare so that on leaving this present body we undergo no more suffering, that is intelligent. But if we prepare to receive another material body for more suffering, is that intelligent? Unless you understand the Lord, unless you understand Krishna , you’ll have to stay in this material world and accept another body. There is no alternative. Now our method. We understand, first, that na hanyate hanyamane sarire: when the body is finished, the soul goes on living. Unfortunately, many people have become so dullbrained that they cannot understand this simple truth. Every day of their lives, people see that a soul in an infant body is going to take on a childhood body, then a teenage body, next an adult body, and later an aged body. People see, with their own eyes, how the soul is transmigrating from one body to another body to still another body. Nevertheless, with their dull brains they cannot understand that at death, when the aged body is finished, the soul goes on to yet another body, material or spiritual. But people cannot understand this. They are so dull-brained. They cannot make the simple distinction between the body and the soul. It will take five hundred years to teach them this simple truth – their education is so advanced.